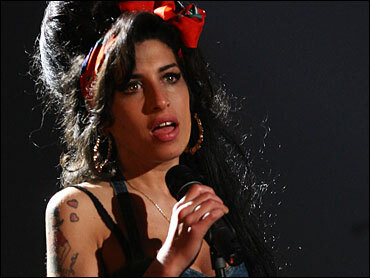 Celebrity pop star Amy Winehouse is up for six Grammys. As CBS News correspondent Elizabeth Palmer put it, Winehouse is famous for her gutsy, jazzy voice -- but infamous for doing drugs, and drunken or even cancelled performances. She's had a tumultuous year, which wasn't lost on comedian George Lopez as he announced one of her nominations. It was clear her reputation had preceded her, as Lopez joked, "Can somebody wake her up this afternoon around six, and tell her?!" He added, "She makes Lindsay Lohan look cool." Winehouse's months of personal problems had taken the focus off her gritty, soulful music. She was nominated for album of the year for her CD "Back to Black." Winehouse was also cited for best new artist, plus record and song of the year for the defiant hit "Rehab." Winehouse, an admitted marijuana smoker, has been dogged by reports of further drug use amid a flurry of canceled concert dates. Just this week, she was spotted walking outside of her London home wearing a bra and jeans, with no shoes, looking distressed. In the video of "Rehab," Palmer points out, Winehouse is in full bad-girl character. But, say critics, the Grammy nominations recognize that her music is not only good, it's great. Says Neil Portnow, president of the National Academy of Recording Arts and Sciences, "I think it talks about the strength and the excellence of her music and the way that it's received by our membership." In two years, says Palmer, Winehouse's style has gone from urban hip to addict chic. Now 24-years-old and the daughter of a London cab driver, these days she's emaciated and heavily tattooed, Palmer observes. Her drunken stage performances are favorites on YouTube. "Amy Winehouse," asserts Sky News entertainment critic Neil Sean, "is a very clever girl ... She knows, when she's pictured looking the tragic diva, wiping her nose as she comes out of a hotel, wandering the streets at three In the morning, she knows that's front page news." Another hit is called, "You Know I'm No Good" but, says Palmer, the British tabloid press think it's Winehouse's husband who's no good. A former video technician, when he was sent to jail this fall on charges of trying to buy off a trial witness, Winehouse went to court to support him. "He's not very good for her on a professional level," Sean says, "but she's so hooked in deep she can't stop the -- I suppose -- the love that she's got for him." Now, Palmer concludes, with six Grammy nominations, the music industry is betting America will fall in love with Winehouse -- at least, her bluesy style and powerful voice -- if not her drunken self-destructiveness. But so far, it seems, she doesn't deliver one -- without the other.